Nowadays, most professional high-end cameras like Canon DSLR can take photos in RAW format. RAW format is an uncompressed image format. Compared to comressed JPEG foramt, RAW picture takes more space but has higher image quality and you have more freedom in post-processing. RAW format is so good for expert photographer, how about RAW videos? Magic Lantern does it. Magic Lantern is a free and opensource software add-on for Canon DSLR cameras. With it you can recorder video in RAW format and save in MLV (Magic Lantern Video) file. Beacuase the quality is so high, you can treat it as a series of RAW photos. If you want to capture some wonderful moment, insteat of click the shutter at the very exact time, you can take a short video and look for the moment in the video. But everything has two sides and the MLV format is no exception. The greatest problem with MLV is that this format has a poor compatibility with most devices, video players and editing software. The following guide focuses on how to improve the compatibility of MLV format by converting MLV to other famous formats like MP4, AVI, MOV, FLV, etc to playback everywhere. In most cases, getting a video file converter to convert MLV files is the best solution. However, not all video converting tools support MLV format. Therefore, we highly recommend Faasoft MLV Converter (for Mac, for Windows) to help you out of the trouble. 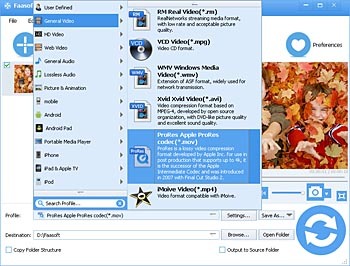 Convert a wide range of video and audio to more popular video formats at your convenience. Edit video and audio before conversion to make your media more special. If Faasoft MLV Converter is what you need, click "Free Download" button and follow the installation guide to install it on your computer. It has both Mac and Windows version and make sure you have downloaded the right version. This step by step guide takes converting MLV to ProRes as example. Run the program. 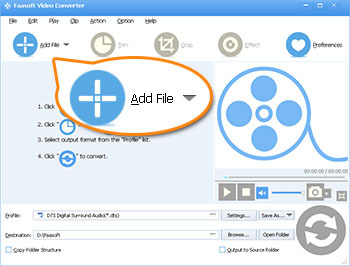 Just press "Add Files" to load MLV files that you want for video conversion. To convert MLV files in bulk, just drag the folder where your MLV files are to the program's main interface. The imported MLV files will appear in the left task list as illustrated. Click the narrow-down button of "Profile" to choose output format as "ProRes Apple ProRes codec (*.mov)" from "General Video" category. Tips: Faasoft MLV Converter provides optimized preset for almost all of the devices so that you can directly select output format from corresponding category for your devices. Switch to "Settings" pane to change the output video resolution, frame rate, bitrate, audio channel, video size and more, if it is indispensable. Once you are satisfied with every setting, just hit the round "Convert" button on the bottom and the program can do the rest for you at a 30X faster speed. © Copyright 2018 Faasoft. All Rights Reserved.